Formerly the Ben Crouch Tavern, the Adam and Eve is a traditional London pub offering classic bar food and a good range of draught and bottled beers. What did you think of Adam and Eve? the reviews below were not for the current pub which is a Geronimo pub they are closed on sundays hence do not sell bad roast dinners and the chef and subsequently the food is of a high standard for a gastro pub. this pub is very busy thursdays and fridays and great for large groups. I love it. Love the decor. Staff was friendly. Roast lunch was a total let down. I had the roast beef - the Yorkshire pudding was burnt, the gravy was too watery, it needed some green vegetables and the roast potatoes had no flavour. Was not delicious at all. Would go back only for drinks. I had my handbag stolen from here. The police told me it was a hotspot for theft as there is no CCTV. The staff on the night were indifferent and offered very little help. Watch out. The fit out is fine, the drinks fairly standard. The food, however, made me very sick (24 hours of being very ill and a week of feeling markedly unwell). Beware - gastro pubs are no fun. Had dinner there last night, not good! I loved the old bar and am happy with the new one. Still has some teething issues but am sure they will be sorted! Will definitely being making this a regular spot. We were rather upset when our Friday night venue - Ben Crouch - closed it's doors. The pub opposite - The Champion - just didn't do it for us. What a relief when Adam and Eve opened. Love the interior, like the staff (there is plenty of them) but wouldn't call it myself a regular - it'd simply become a little too steep with their prices! That definitely changed the crowd as well. 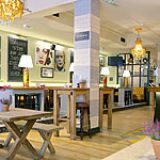 From the Geronimo group, the Adam and Eve is a modern British gastro pub, which offers a welcome escape from the crowds, an easy-going atmosphere and a hearty food menu. Located on a quiet road away from the bustling Oxford Street, Adam and Eve is a warm and inviting gastro pub spread across a single floor. Its colourful and eclectic interior is a welcome break from the sleek and minimalist décors favoured by many. 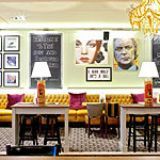 Tan leather sofas littered with plump velvet cushions join mismatched armchairs around the tables set slightly away from the main bar area, and Pop Art-style portraits of British icons like Michael Caine and Twiggy adorn the walls. Little touches like the potted heather on the tables give more of a country rather than inner city pub look and make a nice contrast against the giant yellow chandeliers. Behind the bar, red lit-up letters spell out the word ‘local’, which says a lot about the kind of vibe they are trying to create at Adam and Eve. Warm, bright lighting combined with the subtle background music sets the perfect scene for a catch-up with friends, where you can both see and hear each other clearly – another rarity. Week nights are reasonably quiet considering the central location, although you can imagine it filling towards the end of the week and getting more than its fair share of tourist footfall. The food menu at Adam and Eve is everything a pub grub menu should be, full of all the best-loved classics done well and at a reasonable price. The breaded black olives filled with feta are the perfect nibbles to accompany your wine, and there are a number of sharing plates on offer. Should you plump for a main – and a reassuring amount of their customers do – then you have all the usual culprits of sausages, steak, fish and chips and burgers to choose from. The sausages sit on top of a mound of creamy smooth mash covered in a dark rich gravy and make for a comforting and filling meal, and the burger with all of the trimmings is served on a wooden board with all the pickles, bacon, cheese, onion rings and chips you could wish for, along with three miniature pots of sauce. It’s clear pubs in the city have had to up their game on the burger front since the dirty food trend emerged, and Adam and Eve seem to have taken this on board. 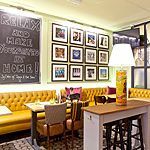 The well stocked bar has the wide selection of sprits and beers you would expect from a Geronimo chain member, who pride themselves on stocking brews from around the UK and abroad. The wine list, compiled by their Master of Wine John Clevely, also ticks a lot of the boxes with a selection nicely segregated into taste brackets at an array of price points and measures. Costing under £18, the Chenin Blanc is a great option. Fresh, fragrant and finishing with the typical honey notes that make it such an easy wine to drink. For an easy escape from Oxford Street, Adam and Eve is certainly a pub worth knowing about.